What is the Audio Engine? Liquid Rhythm runs in a two process model. The main application’s graphical user interface is separate from the Audio Engine for performance reasons. Thus when Liquid Rhythm starts it will launch two processes, and the graphical user interface will need to connect locally to the second process. When we are run in a standalone mode (for example, if you launched Liquid Rhythm by clicking on the icons on your desktop), we use Cycling ’74 MaxMSP as the core component of our audio engine. Usually on the very first launch of the application after a fresh install, the audio engine takes longer to startup, as it needs to configure itself to the new environment and version. On subsequent launches, it should take less time. 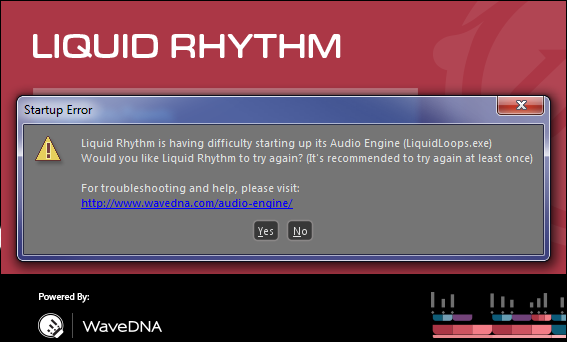 Chances are you are on this page because you receive the following warning message when you started Liquid Rhythm. The first thing to note is to give the Audio Engine a chance to startup, before attempting the troubleshooting below. Note, these troubleshooting steps do not apply if you are launching Liquid Rhythm as a VST/AU/RTAS plugin or through the special Max For Live integration. Warning message received when Audio Engine cannot be started by Liquid Rhythm. Liquid Rhythm is having difficulty starting up its Audio Engine (LiquidLoops.exe). Would you like Liquid Rhythm to try again? (It’s recommended to try again at least once). If you have tried launching Liquid Rhythm use the Task Manager to see if there are both processes are started. If LiquidLoops.exe starts, but then soon disappears, it likely means our Audio Engine failed in its startup. In testing at WaveDNA, we discovered that the Audio Engine will attempt to discover all of your audio related drivers. In some case, old drivers in the system will cause it to fail abruptly. Please check if the audio drivers are up to date. One driver we have had an issue with specifically are the M-Audio/Protools drivers. 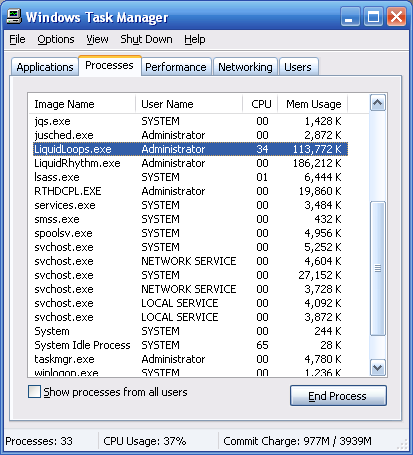 After a successful Liquid Rhythm launch, we would expect to see two Processes listed in Task Manager, as shown below. You can launch the Task Manager by hitting the ‘Ctrl-Alt-Del’ key on your computer at the same time. In the Task Manager you want to observe the LiquidLoops.exe which is the Audio Engine for Liquid Rhythm in standalone mode. Alt-Ctrl-Del to show the task manager, verify that LiquidLoops.exe is able to launch. 1. Delete: The Liquid Rhythm folder within your User folder. 4. Upon start up, your audio engine issues should be solved! If you are having more issues or if this doesn’t help, please contact Support. If you have Protool or M-Audio drivers, please ensure you have the latest versions. We noticed that Audio Engine would fail when attempting to load when we have out of date Protools 8 drivers on one of the test system.